The kanji kentei is the official test for native Japanese speakers; the level 10 is for 1st graders (6-year olds). We will only go over the basic kun-yomis and on-yomis; at this moment there is little point to learn correct but more advanced readings of a kanji. 1-st graders learn 80 kanjis that we have split in 5 groups. We can use the following list to review them, or go to the link to study them. I was born in this village. watashi wa kono mura de umaremashita. This is the entrance; that is the exit. kore wa iriguchi desu; are wa deguchi desu. This car is fast, right? kono kuruma wa hayai desu ne. A large cake and a small fork. ookii keiki to chiisai fouku. comment: 面白い (omo-shiro-i – interesting) comes from 面 (omo – face, mask), and 白い (shiro-i – white), because when we see something interesting, our faces ‘brighten’ or ‘light up’. amerika no hata wa aka, shiro, ao desu. Japanese people are not color-blind and can tell perfectly well green from blue. The reason ‘ao’ can be either red or blue is because ‘ao’ covers more colors than our blue. 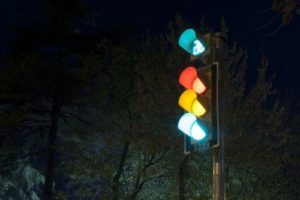 For example, in Japan the traffic lights are red, yellow, and either green or blue, but regardless of whether it is green or blue, Japanese refer to it as ‘blue’. The grass and the sea are also ‘ao’ [Taekim]. The name for the color green is ‘midori’, though, so a frog would be ‘midori, not ‘ao’, but a green traffic light would be ‘ao’, not ‘midori’. 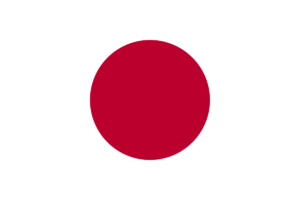 On the token of colors, in many countries we draw the Sun yellow, but in Japan the Sun is drawn red, e.g., the red circle in the Japanese flag is the Sun; well… it is the ‘Rising Sun’ flag, after all. In reality, we are all off because sunlight is white; ‘daylight’ and ‘full-spectrum’ lightbulbs that mimic sunlight, used in places where we need to be alert – kitchens, reading rooms, and garages – produce a white light, different from the yellow light of ‘soft-white’ lightbulbs, used in places where we relax – living rooms and dormitories. This year there are three teachers. kotoshi sensei ga san nin imasu. Last night I saw the moon. yuube ni tsuki wo mimashita. ‘sensei’ (teacher) is written ‘先生’, meaning ‘before in life’. This is the same 先 of 先週 (sen-shuu – week before), 先月 (sen-getsu – month before), and the ubiquitous 先輩 (sen-pai – someone older or with a higher rank than me) that shows up in every anime that takes place at a school. teeburu no ue ni okane ga arimasu. The dog is in the car. inu wa kuruma no naka ni imasu.